TNT has ordered a pilot for an hour-long “Snowpiercer” series, based on the movie of the same name, TheWrap has learned. Tomorrow Studios and Turner’s Studio T are co-producing the pilot being executive produced by writer-showrunner Josh Friedman (“Terminator: The Sarah Connor Chronicles”) and Tomorrow Studios’ Marty Adelstein (“Teen Wolf”) and Becky Clements (“Aquarius”). Bong Joon Ho, who directed the feature film starring Chris Evans, Jamie Bell and Tila Swinton, will also executive produce, along with Park Chan-wook, Lee Tae-hun and Dooho Choi, as well as CJ Entertainment. The show is set seven years after the world has become a frozen wasteland, and the remnants of humanity inhabit a gigantic, perpetually moving train that circles the globe. Class warfare, social injustice and the politics of survival are questioned in this riveting television adaptation. Evans played the main character who led a lower-class uprise in the film. No cast for the series has been announced yet, but the network is actively writing additional episodes. 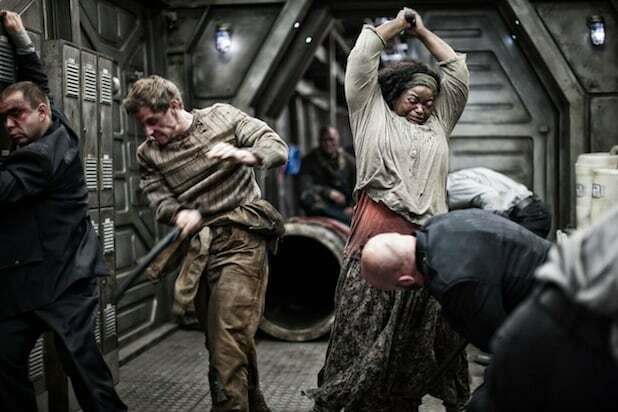 Also Read: 'Snowpiercer' Reviews: Should Action Fans Consider This Limited Release Over 'Transformers' Dinobot Beasts?